I’ve been playing around with BERG’s Little Printer for a while now, and one of the things I find myself often wanting to do is print out quick notes – shopping lists, a quick To Do list – little things like that. There’s currently no easy way to do that, so I put together a simple little web page to enter some text, format it and send it on to your Little Printer, and here it is: Little Notepad. 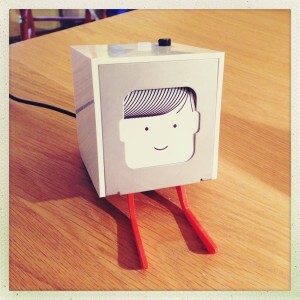 It uses the Little Printer Direct Print API, and for that, you need to know the unique code for your Little Printer. You can find that at the bottom of this page. The text editor I’ve used is a jQuery plugin, jWYSIWYG. Little Notepad is still a work in progress, so you might find the odd glitch, and there are a few more features I’d like to add, but so far, it’s proving handy for printing out the odd few inches of notes. 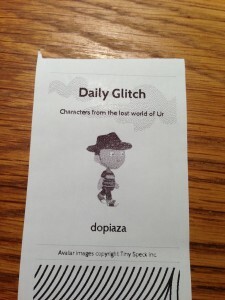 This entry was posted in Development, Little Printer on January 27th, 2013 by dopiaza. Over in the Utata group on Flickr, there’s a social photo game that we occasionally play. Somebody takes an image of a piece of art (e.g. a painting) and chops it into small squares. 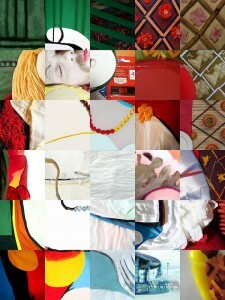 Each participant is then randomly allocated one of these squares and they have to take a photograph that represents the square – a real-world representation of the contents of their allotted piece. The photographs are then stitched back together to produce something that (hopefully) resembles the original painting. We’ve just completed the Round 2 of Exquisite Corpse, and I think we did a pretty good job. As before, I’ve put together a little widget to show the Utata version along with the original so you can compare the two. You can find that, along with our Round 1 result, here. This entry was posted in Photography, Utata on September 20th, 2012 by dopiaza.